Ostensibly, Newcastle NSW just gained a crucial commuter and tourism route when Aeropelican starts flying Newcastle > Canberra route. Cheers all round. Except from Jetstar, who were running a monopoly on the Newcastle > Sydney route, which Aeropelican will now fly. Jetstar have been the monopoly operator in and out of Newcastle since NSW regional carrier Brindabella folded in 2013. Aeropelican will now also cover Sydney>Mudgee, another route that was left in the lurch when Brindabella folded. The Mid-Western Regional Council paid $670,000 to the airline directly to cover costs. 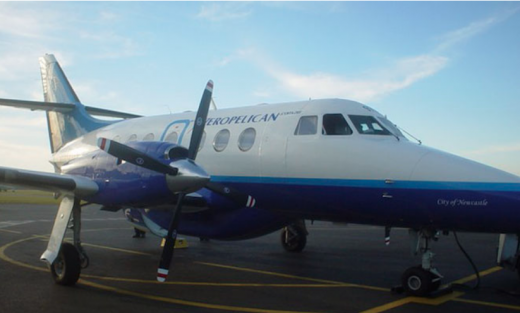 Aeropelican was previously run out of Belmont Airport, which was bought by Mirvac in 2006. Many regional routes across Australia are covered by exclusive licenses – the idea being that if, say, Brindabella puts in the effort to fly 5 days a week to Mudgee, a route that may not be extremely profitable, they will be guarded from competition. When Brindabella folded in 2013, the NSW state government offered no excuse as to why regional towns weren’t safeguarded against the somewhat predictable risk of an unprofitable airline going into administration. The collapse of Brindabella cut off the aeronautical life blood to more than five major regional centres. Pelican Airlines will commence regular public transport flights (RPT) between Newcastle and Canberra on June 1 after securing all the necessary approvals from the Civil Aviation Safety Authority (CASA). The Newcastle-based Pelican will offer a twice daily service on weekdays, as well as one flight on Sunday, with 19-seat BAE Jetstream 32 aircraft, restoring direct service between the two cities for the first time since the collapse of Brindabella Airlines in December 2013. Separately, the airline also announced on Tuesday it would start Sydney-Newcastle flights on June 11 with two flights s day on weekdays and one flight on Sunday. Regional Express (Rex) is currently the only airline offering RPT flights on the route. And Pelican is also launching 11 flights a week on the Sydney-Mudgee route – a NSW government regulated route – from June 11, restoring air links on the city pair for the first time in 16 months. Pelican has been working with CASA since February to vary its Air Operator’s Certificate (AOC) to include RPT services, having been primarily a charter operator. “The necessary approvals to start scheduled flights for the airline had been long awaited and he was thrilled that the first flight was now less than one week away,” Pelican chief executive Paul Graham said in a statement. Graham said the airline was looking forward to restoring air services between Canberra and Newcastle, which links the nation’s capital with RAAF Williamtown and is likely to target the government, business and defence sectors. “This service is in high demand especially with the RAAF base located at Williamtown, Newcastle, and also with public servants commuting and working in Canberra,” Graham said. Newcastle Airport manager for aviation business development David Nye said Pelican’s new service would help fill a significant gap in the market that arose following the collapse of Brindabella. “The business community has been very vocal in their desire to see these services brought back and I’m pleased we’ve been able to do so,” Nye said in a statement. DIRECT flights between Newcastle and Canberra will resume next week in a move that has boosted the mood of Hunter business and tourism groups. FlyPelican, a new airline formed by some of those behind the Aeropelican service which used to operate out of Belmont, will also run daily flights between Newcastle and Sydney. It’s a major vote of confidence in Newcastle Airport and the Hunter market which has been without a Canberra service since Brindabella folded in 2013. FlyPelican chief executive Paul Graham confirmed on Monday the airline now holds all its regulatory licences and will begin Canberra services next Monday, June 1, and start Sydney services on June 11. ‘‘FlyPelican is extremely pleased to be providing this important service and we’re looking forward to reinstating this crucial link,’’ Mr Graham said. Mr Graham said he was confident the route would be viable for the company, and popular among those working at the RAAF base and public servants who commute between Newcastle and the capital. The company will fly the 19-seat Jetstream 32 aircraft on the route with the aim of carrying between 15,000 and 17,000 passengers annually. Fares to Canberra start at $149 one way, he said, while Sydney services will cost $89 one way. Two services will go to Canberra each weekday, and two to Sydney, each with two afternoon services coming back to Newcastle. Sunday flights for both destinations will be introduced. FlyPelican will compete with Rex airlines on the Newcastle-Sydney route. Hunter Tourism chairman Will Creedon said the news would boost tourism in the region. ‘‘It’s fantastic to be getting a service back that we’ve sadly missed,’’ he said. ‘‘It’s always added tremendous value to the Hunter’s economy. Fly Pelican says ratepayers money will help air travellers better afford the trip between Mudgee and Sydney. At an extraordinary meeting this week, Mid-Western Regional Councillors voted to provide $670,000 to airline Fly Pelican to provide the service. Chief of Fly Pelican, Paul Graham, said any support from council will assist with operations. Firstly really maintain fares at a reasonable level so that we can actually get the patronage that we need on our services from Sydney to Mudgee,” he said. Mr Graham confirmed the funding from the Mid-Western Regional Council would be used to set up flights between Sydney and Mudgee. He said the headquarters would remain in Newcastle because it’s easier to operate services into Sydney. “We have to get to Sydney to operate to Mudgee,” Mr Graham said. Mid-Western Mayor Des Kennedy said earlier this week it’s a vital service for many in the area. “It’s a gamble that I think the region needs, I think if the region is going to keep prospering,” he said. Councillors voted unanimously to provide the funds which would come out of the council’s airport reserves. The money would lock in an air service for two years and is due to start in April. Resurrection of Belmont Airport in Newcastle is going ahead under the consortium the bought the property in May. The airport had fallen into a state of disrepair since regional airline Aeropelican withdrew operations in 2006 and sold the property to Mirvac. According to a report in the Newcastle Herald, the consortium has already spent $100,000 cleaning up the airport grounds, and there is still a lot of work to do yet. The new owners, which include Matt Hall, Skydive the Beach, Airborne and Newcastle Helicopters, plan to transform the airport into a vibrant general aviation hub. Plans are for engineering facilities for Matt Hall Racing and Newcastle Helicopters, adventure flights and sports aviation. There have also been hints of a flight training facility for overseas students, a proposal that could prove a problem given the airport’s proximity to housing. Belmont is one of the few (if not the only) airports in Australia that have been returned to service having been bought by a development company.